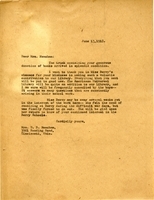 Letter written on behalf of Mrs. H.L. Wayland, accompanying her annual contribution to the schools. 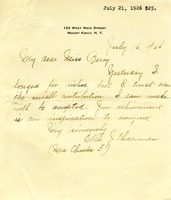 Mr. McCarstey states that Mrs. Wayland is too ill to write the letter herself. 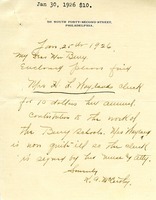 John Stanley writes Martha Berry to inform her of a $75.00 donation being made to the Berry Schools. 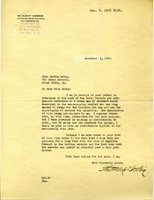 This is a letter from Mrs. E.W. 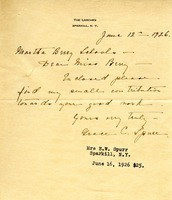 Spurr to Martha Berry. 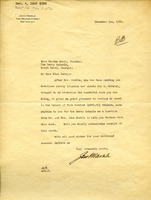 Mrs. Spurr is writing to say that she has enclosed a small contribution for the good work that Miss Berry has done. 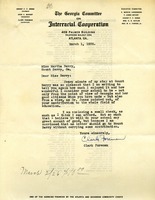 George C. Perkins from Newark donates $100. 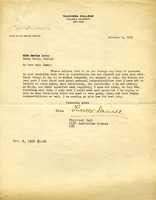 Mrs. Slivers sends her yearly contribution to Berry. 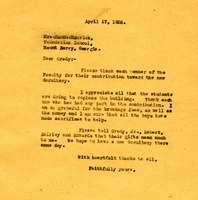 John Markle encloses a $500 contribution, sent after his wife, Mary R. Markle described the work of the Berry Schools. 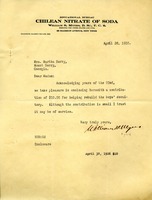 Ella writes to Martha with a small contribution to the schools. Telling Martha that her achievement is an inspiration to everyone.